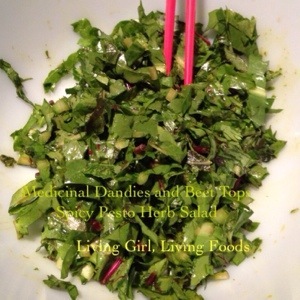 I’ve been creating Medicinal Herb Salads for dinner consistently now for a few days and thought I was overdo on sharing some concoctions and information. Herbs all have medicinal qualities, most of them are ideal for detoxing and digestion. They can be helpful with pulling metals, toxins, or if parasites are a concern. Some herbs that we all are familiar with is safe, rosemary, parsley, cilantro, thyme, oregano, and basil just to name a few! Things like Arugula, Dandelion Greens, and Plantain have more of a bitter taste. This aids in digestion and can be a little more tricky to balance in a dish. The greens like Arugula, Basil, Dandelion Greens and Alfalfa are more nutrient packed compared to the other items on this list. Anything with some heat; habanero, jalapeno, cayenne, etc. Any toppings you are into; tomatoes, root vegetables, seeds like flax or sesame, peppers, cucumbers, olives, fennel you name it 🙂 I like my medicinal salads to be a little more simple, just to mix things up and to be even easier on digestion. I’m personally a huge fan of adding beet top greens in mine since they are excellent for pulling metals and are rich in iron ❤ They give a great color, usually people are deliciously surprised by the use of them and they add an exta crunch! Medicinal Herb Salads can be rather warming depending the ingredients used. 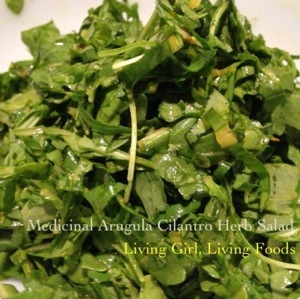 Arugula and many of the herbs add a fresh and clean feel but also give it a kick. Since many of these ingredients aid in circulation, it will be helpful with warmth as well as staying healthy and providing oxygen to our blood cells. If your bored with salads or possibly just stuck in a routine on how you make them, focusing on creating a medicinal herb salad might get some fresh ideas flowing and may be even some produce that isn’t common in your kitchen. Have fun making your creation, chopping the ingredients, picking out spices, and make something as simple or complex as you would like. I think I have personally “wowed” more people with coming up with unique salads or soups, the things we all find ourselves to be stuck in a box or formula with. Try mixing things together that you normally wouldn’t, if you aren’t pleased with the taste you can always balance it out.